DBHIDS | Nicole Connell, M.Ed. Nicole Connell is Special Advisor to the Commissioner of the Department of Behavioral Health and Intellectual disAbility Services (DBHIDS). She is involved in activities that support the Commissioner in ongoing system transformation initiatives designed to advance behavioral health and intellectual disAbility services through a population health framework. Connell has extensive experience in Philadelphia’s various social services systems, and nonprofit community based organizations. Connell has expertise in education, community organizing, partnership development, and federal grant management. She worked for several years in DBHIDS’ Strategic Planning and Innovation Division where she provided guidance and leadership for many of the department’s innovative population health initiatives. She also implemented procedures which significantly enhanced the efficiency of the Community Based Services Development Unit . Prior to joining DBHIDS in 2014, Connell worked for several years as the Program Manager for Self Sufficiency Services at the Philadelphia Housing Authority (PHA) simultaneously implementing three federal grant programs designed to improve the quality of life for the 80,000 residents housed by PHA. Early in her career, Connell worked as an educator with the Philadelphia School District as part of a program designed to support children experiencing both academic and behavioral health challenges. 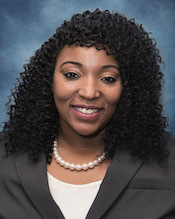 She also has experience as a Master Level Resource Specialist in the Philadelphia School Based Social Service (SBSS) program which connected families and children to vital behavioral health and social services needed to overcome challenges that impacted school achievement. As a city native, Connell is extremely passionate and connected to efforts aimed at improving the quality of life for all Philadelphians, specifically those belonging to vulnerable populations. She is a graduate of Temple University’s College of Education, Eastern University, and is currently a doctoral candidate of Public Administration. Connell remains active in both civic and service organizations and serves in positions of leadership on nonprofit boards/advisory committees.